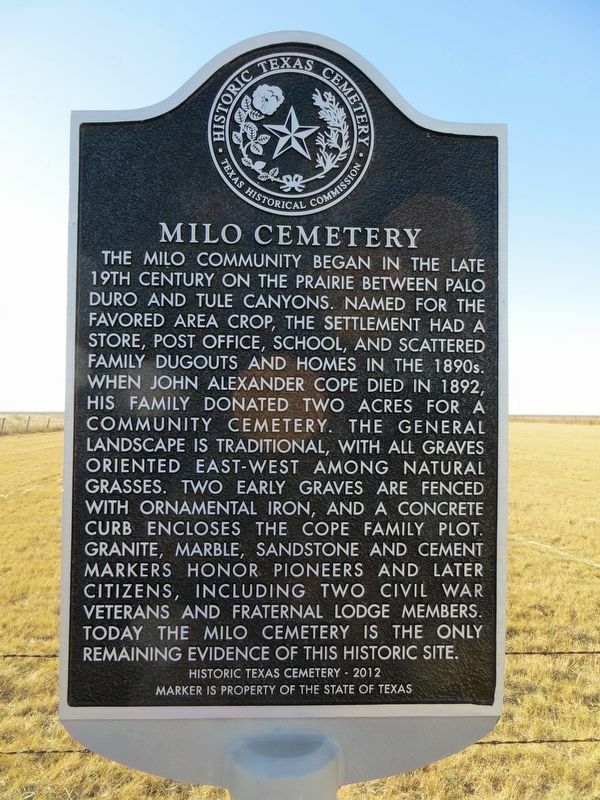 The Milo Community began in the late 19th century on the prairie between Palo Duro and Tule Canyons. Named for the favored area crop, the settlement had a store, post office, school, and scattered family dugouts and homes in the 1890s. When John Alexander Cope died in 1892, his family donated two acres for a community cemetery. The general landscape is traditional, with all graves oriented east-west among natural grasses. Two early graves are fenced with ornamental iron, and a concrete curb encloses the Cope family plot. Granite, marble, sandstone and cement markers honor pioneers and later citizens, including two Civil War veterans and fraternal lodge members. 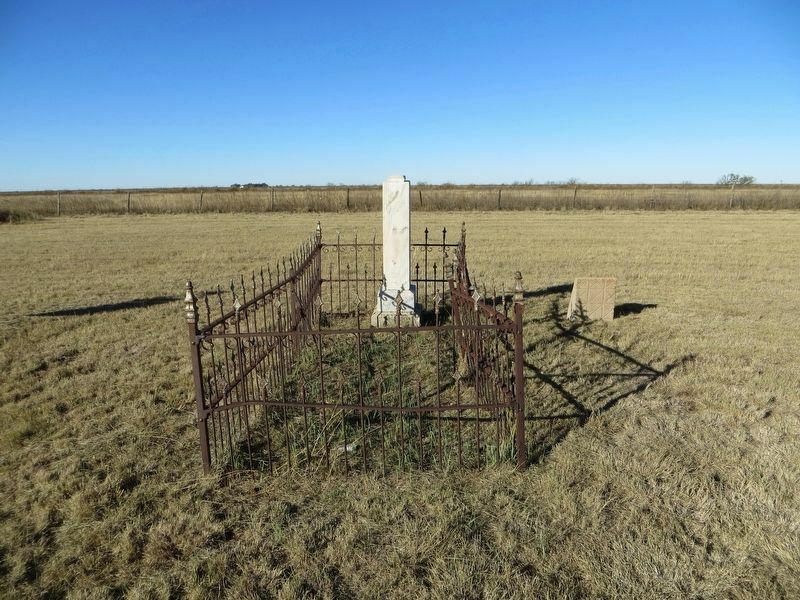 Today the Milo Cemetery is the only remaining evidence of this historic site.
. Marker is on Farm to Market Road 3300 one mile west of Texas Highway 207, on the left when traveling west. Touch for map. Marker is in this post office area: Silverton TX 79257, United States of America. Touch for directions. Other nearby markers. 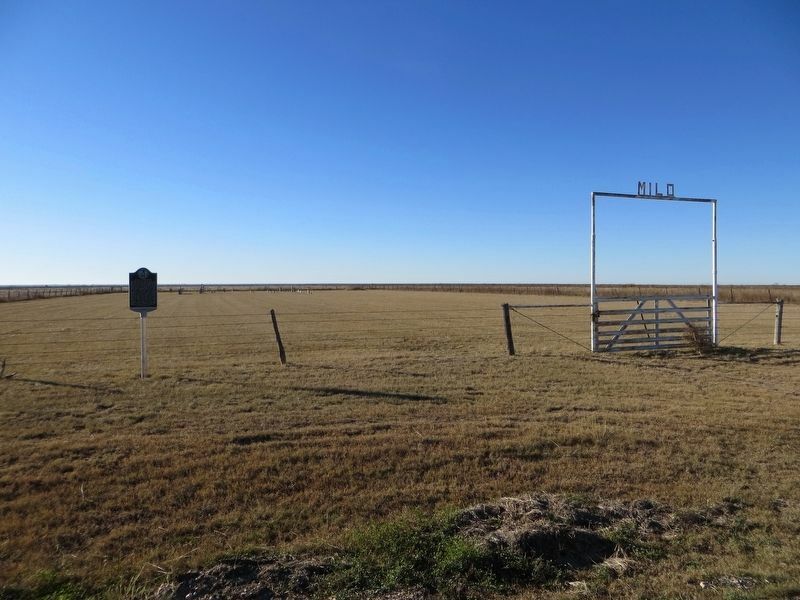 At least 8 other markers are within 12 miles of this marker, measured as the crow flies. Archeological Sites at Mackenzie Reservoir and Tule Canyon (approx. 3.2 miles away); The Vigo Park Methodist Church (approx. 4.8 miles away); Quanah Parker Trail (approx. 9.4 miles away); Palo Duro Canyon (approx. 9.4 miles away); Site of Celtic Post Office (approx. 11.6 miles away); Pleasant Lafayette Crawford House (approx. 11.7 miles away); First Baptist Church of Silverton (approx. 11.7 miles away); First Methodist Church of Silverton (approx. 11.8 miles away). Touch for a list and map of all markers in Silverton. More. Search the internet for Milo Cemetery. Credits. This page was last revised on November 21, 2016. This page originally submitted on November 21, 2016, by Bill Kirchner of Tucson, Arizona. This page has been viewed 297 times since then and 5 times this year. Photos: 1, 2, 3. submitted on November 21, 2016, by Bill Kirchner of Tucson, Arizona.